Thinking back on what your first match is quite easy but remembering what the first string you used is much more difficult. The genesis of your tennis professionalism is emphasized with the best gear, and the Babolat Origin makes it so you never forget what string got you to the top. The Origin is made from polymide monofilament to ensure that players can have a great feel like that of Natural Gut while maintaining the durability you expect from a polyester. 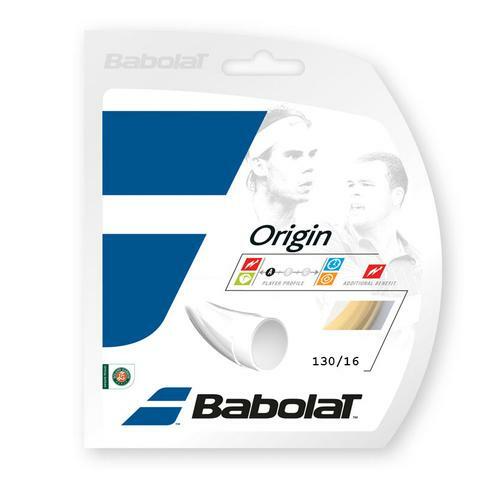 Babolat combines an innovative polyamide, called PureCombo, from natural resources with a monofilament construction. This amounts to a special combination of power and comfort in a synthetic string. Upon taking the string to the court, Tennis Plaza testers found that we were able to put more power on the ball without any added effort. We would also like to note that this string is great for those who are suffering from any arm-related injuries. Comfort was seen throughout every stroke and the durability was great for a synthetic gut. Originate a new chapter in your game with the Babolat Origin Tennis String! Don't need a damper with this string, no elbow pain anymore.